From the first moment I heard them, A Nightmare From Texas took me back to some cool moments in time that I would love to see more bands use as a launching pad. Falling somewhere between traditional classic metal bands and having hints of the early 90’s thrash albums where there was a hint of groove added, A Nightmare From Texas sound fresh in today’s world as all the vocals are clean with plenty of hooks and plenty of guitar solos too. This eight-song debut album appeared on my timeline as a Facebook sponsored post, and I felt even more compelled to click the link as the band are from my part of Texas. I was curious after reading the description of the music, so I did the previews on iTunes and later that day purchased the album. A Nightmare From Texas clearly put a lot of heart and soul into this self-released and self-produced debut album as the sound is remarkably clear and well mixed. Kicking things off with the riff of ‘Murdered You’ rising up from silence and leading into thrashy territory a la Testament or Flotsam and Jetsam. The chorus slows the pace (‘Black’ album-esque) for a cool pre-chorus that leads into an extremely catchy chorus. I mention Flotsam and Jetsam because their ‘Cuatro’ album has come to mind a few times as I have played the album over the past week. The band do not overdo the chorus over the course of the five-minute running time as they pack in some nice guitar solos by Anthony Padilla and have some sinister laughing and voices in the mix at the end. As an opener, it does a great job pulling the listener in to what comes next. The title track gets things moving at lightning thrash speed with some haunting backing vocals added just before the verse. Logan Herzog channels a bit of Hetfield at the beginning of the chorus and creates a huge hook before we quickly get back into the next verse. The band do not leave themselves much room here with the four minutes incorporating a cool spiraling solo with a false ending then giving us one last hook filled chorus. ‘No Escape’ starts with a guitar riff giving way to the verse. The band add new elements here with a sinister sounding pre-chorus leading into a hooky chorus which finds Herzog utilizing a very clean hook. The band bring in some rougher vocals at times here, but they are always easy to understand and not anywhere near-death metal vocals. The description that comes to mind is if Savatage would have used something a little gruffer around the time of ‘Hall of the Mountain King’ or ‘Gutter Ballet.’ The band has a breakdown that makes it easy to see the pit spinning before a rapid-fire solo by Padilla closes the song. Wrapping up side one is ‘Holding On’ which sounds a bit more NWOBHM influenced with it incorporating some more commercial sounding touches with its melodic chorus being very catchy sounding, but there are so many words that it takes time and listens to truly fully get right so the song will truly have some staying power. The guitar solo has influenced some air guitar from me, and this ends the first half in fine style. Melodic guitar opens the second half of the album where ‘Not the Same’ initially reminds me of an early Iced Earth ballad, but the song goes further than that as there is an escalating guitar solo following the chorus that then drops back down to a mellower pace as the band then climbs the ladder again. I really love the solos here by Padilla, especially the second one where it contains a beautiful clear passage that transitions into a heavier and rougher one to close the song. ‘Rio Grande’ finds the band ramping back up the tempo with some vocals in the verse that make me think of the likes of Mille from Kreator. The ultra-melodic vocals that serve as a call and response in the pre-chorus and featured in the chorus create some dynamics in what is otherwise a straight forward thrasher with another mosh ready breakdown in it. This song has not hit me as hard as most of the others here though. ‘Halo Held Up By Your Horns’ keeps the high tempo pace and features a variety of clean vocals, as the screams here are still clean vocals in my book. The chorus is extremely catchy and melodic here with this song musically having some traces of the likes of Death Angel. The band have created more of an epic here with the nearly 6 minutes containing no wasted moments. Padilla again nails the guitar solos with Mitchell Almonte providing the excellent rhythm guitar to make it happen. The band close with another epic in ‘Live Like Kings’ which again slows the pace overall. While it is not my favorite on the album, it does contain several moments that grab me. The vocal hook at the end of the chorus initially strikes hard and unexpectedly. There are so many things going on here though that I think this song will continue to grow on me. After many listens, the song that comes to mind for a comparison musically is something like ‘Cathedral Spires’ by Judas Priest, without the vocal histrionics. The band recorded the album as a trio with Herzog playing the drums and Padilla and Almonte splitting bass duties on the recording. Almonte also provides the screaming vocals which are still clean to me. As a new band looking to make an impact, these eight songs should help them do it, if they can get their name out there. This isn’t a reinvention of the wheel, but I also don’t see it as a nostalgia trip either. A Nightmare From Texas remind us that there is a reason we love the metal of the past and have used it as a template for the future. I will hopefully be able to catch them live near me soon. 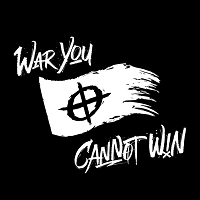 ‘War You Cannot Win’ is available now on the usual digital outlets.